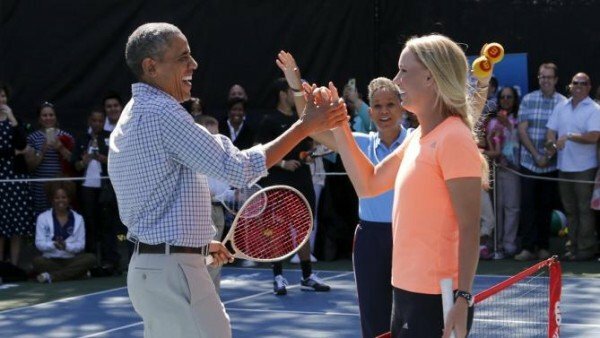 President Barack Obama and World No 5 Caroline Wozniacki played tennis at the White House as part of the annual Easter Egg Roll event on April 6. Caroline Wozniacki took part at this year’s themed #gimmefive campaign aimed at promoting more active and healthy lifestyles among American people. This year’s White House Easter Egg Roll was broadcast on Live! with Kelly and Michael. Rolling Easter eggs on the White House South Lawn is one of the most eagerly anticipated spring events in Washington DC. The White House hosts the Easter Egg Roll every year, inviting children and their parents to come and hunt for eggs, take part in sports activities and enjoy celebrity appearances.